Trade Unions and Democracy explores the role of trade unions as products of, and agents for, democracy. As civil society agents, unions may promote democracy within the wider society, especially in the case of authoritarian regimes or other rigid political systems, by acting as watchdogs and protecting hard-won democratic gains.Established democratic institutions in many advanced societies are facing new challenges. The problem with using trade unions for this purpose is that they remain locked in a cycle of political marginalization and decline. Beyond this, there are, ironically, serious questions about whether unions themselves internally function as democracies. Certainly there are tensions between rank and file membership and an authoritarian leadership, with this infighting having possible effects on strategic deals or alliances and member accountability and actions. On the other hand, trade unions continue to represent a significant component of society within most industrialized countries, and in many case, they have a demonstrated capacity for working with other elements of civil society. Looking forward, trade unions may be able to play a vital role in channeling and focusing spontaneous popular upsurges. In the process, they may revitalize themselves through use of greater internal democracy and become geared toward more diverse constituencies. The question is, will they fulfill this promise or continue to suffer from internal breakups and external breakdowns? Can trade unions save themselves and democracy, or will both deteriorate in time?Trade Unions and Democracy brings together a distinguished panel of leading and emerging scholars in the field and provides a critical assessment of the current role of trade unions in society. It explores their capacity to affect political policies to ensure greater accountability and fairness. 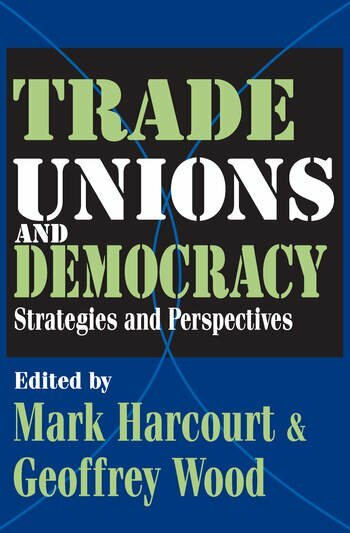 It also explores the nature of and extent to which internal representative democracy actually operates within trade unions themselves.Mark Harcourt is a professor in the Department of Strategic Management and Leadership at Waikato University in New Zealand.